The Art Institute of Chicago, Helen Birch Bartlett Memorial Collection. The Norton Simon Museum presents an installation of Vincent van Gogh’s tender and intimate Bedroom from 1889, a highlight of the Art Institute of Chicago’s superb 19th-century collection. A meditation on friendship, hope and crushing disappointment, Van Gogh’s Bedroom serves not only as a kind of self-portrait, but also as a symbol of the artist’s wandering existence and search for an elusive sense of repose. The second of three versions of the interior scene, the Chicago Bedroom was painted by the artist while at the asylum of Saint-Paul-de-Mausole at Saint-Rémy-de-Provence, France, in September 1889. Its installation at the Norton Simon Museum marks the first time the painting has been on view on the West Coast, and it will hang in the Museum’s 19th-century art wing, surrounded by the Simon’s own important collection of Van Gogh works, from Dec. 9, 2016 through March 6, 2017. (16 October 1888. Van Gogh Museum, Vincent van Gogh: The Letters, No. 704). The artist’s specific interest here in the decoration of his home betrayed nervous excitement in anticipation of Paul Gauguin’s arrival the following week. Already Van Gogh’s friend, competitor and artistic idol, Gauguin was to be his collaborator at last, to live and work by his side in the Yellow House. The violet walls, the butter yellow chairs and bedstead, the selection of portraits on the wall in the bedroom: these were all carefully chosen with Gauguin’s future residence in the adjacent room in mind. The dream of a shared Studio of the South, however, proved short-lived, descending before the year was out into a nightmare, when Van Gogh experienced a nervous breakdown in late December and presented a severed portion of his own ear to a local prostitute. In and out of the hospital at Arles through the spring of 1889, Van Gogh admitted himself to the asylum of Saint-Paul-de-Mausole at Saint-Rémy-de-Provence in early May. It was there, the following September, that he undertook the second and third versions of his Bedroom, today in the Art Institute of Chicago and the Musée d’Orsay, respectively. Both were adapted from the original canvas, which had sustained serious water damage in a flood at Arles. As he copied the damaged Bedroom in his asylum studio at Saint-Rémy, the hopeful moment that picture had once captured must have seemed to Van Gogh far away. Yet the second version—the Chicago picture—is, if anything, more startlingly vivid than its predecessor, its colors more vigorously contrasted, its surface more thickly covered in paint. Hoped for, lost, and longingly remembered, the peaceful scene here rematerializes with the intensity of a fever dream. 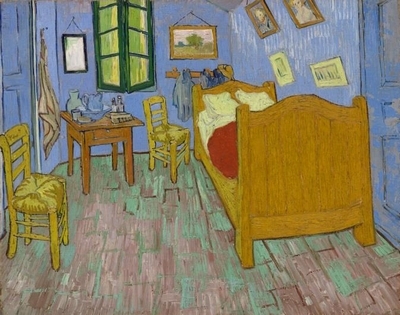 Van Gogh’s ‘Bedroom’ on Loan From the Art Institute of Chicago is organized by Chief Curator Carol Togneri. The painting’s installation at the Norton Simon Museum comes shortly after the Art Institute’s revelatory exhibition “Van Gogh’s Bedrooms” (Feb. 14–May 10, 2016), which brought together all three versions of the interior and presented new research on the works. That exhibition’s curator, Gloria Groom, chair of European Painting and Sculpture and the David and Mary Winton Green Curator at the Art Institute of Chicago, will present a lecture on Van Gogh and his ‘Bedrooms’ at the Norton Simon Museum. Information about additional events, including a lecture by Van Gogh Museum Director Axel Rüger, will be made available this fall. Saturday, Jan. 7, 2017, 4:00–5:00 p.m.